Only a week or so to go now left in #Blogtober! 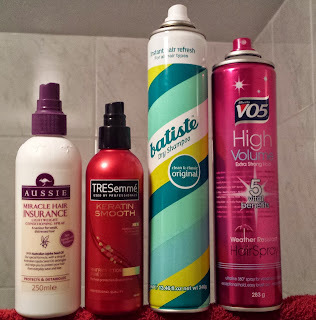 I thought I would share with you a couple of my hair care essentials. 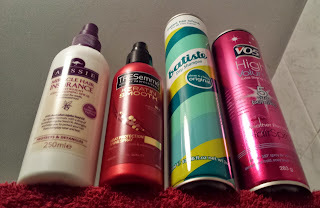 Outside of shampoo/conditioner, what items I use in my daily hair care routine. The first two products I use after the shower, Aussie Leave-In Conditioner & TRESemmé Heat Protector. I adore the smell the conditioner and it's perfect as a de-tangler. Then the heat protector works wells, leaves a nice finish on my hair and I really like the large spray. I have tried a few that fire out in a line and you find you have lumps here and there of product. The spray on this leaves a fine mist over the hair, it's perfect! Then on the right I have the ever popular Batiste Dry Shampoo. It's of course great for in between washes, but on top of that, you can use it to help build volume in your hair. Finally I have the Alberto V05 Hair Spray. I think this spray is great for holding my hair without leaving too much residue or making my hair flaky. Do you use of any these products? What's in your essential hair care collection? Love this post, I'm big into Batiste dry shampoo, I use it under my fringe every day so stop it getting greasy!